Colonel Joseph Montfort: Treasurer of the Province of North Carolina, Colonel of Colonial troops, patriot and Freemason; born in England in 1724; died in North Carolina, March 25, 1776. He was a member of Royal White Hart Lodge at Halifax, NC. On January 14, 1771 he was commissioned Provincial Grand Master of and for America, which authority he and his Deputy, Cornelius Harnett, exercised until the death of Montfort in 1776. His Grace, Henry Somersest, the fifth Duke of Beaufort, Grand Master of the Grand Lodge of Free and Accepted Masons of England, made this commission. 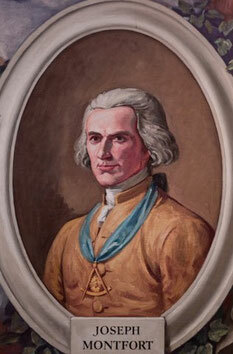 During his tenure as Provincial Grand Master and prior to his death, Joseph Montfort chartered a number of the early lodges in North Carolina. Some of these lodges included; St. John’s Lodge No. 3 at New Bern, Royal Edwin Lodge No. 5 at Windsor, Royal William Lodge No. 6 at Winton and Unanimity Lodge No. 7 at Edenton. The chartering of these lodges as well as a few others not chartered by Montfort occurred prior to the official formation of the Grand Lodge of North Carolina established in 1787. The following members and honorary members of Phoenix Lodge No. 8 are known to have received the Joseph Montfort Medal. Wallace Everett Caldwell, PM, Past Grand Master, (Honorary Member), awarded in 1952.